I love when my ex-husband comes to town, because it’s always a fun afternoon of catching up and eating really good food. Perry flies a private jet for a company in San Diego, and on occasion he and his co-pilot have just enough layover time for lunch in L.A.
Perry and I were married almost 22 years ago and I think it’s pretty amazing that we remained friends after divorcing. When I met my husband Peter (in ’94), he liked my ex so much that he insisted on inviting him to our first Thanksgiving dinner. And when my nephew Cody graduated from High School two years ago, Perry and his wife Karen came to celebrate at my sister’s house. We’ve got quite the special extended family and I’m so grateful for it. When I look back at the years I spent with with my ex, there is only one MAJOR regret that still, to this day, annoys me. Even though he was (and is still) one of the best cooks I’ve ever known, there were times when I didn’t let myself enjoy his food. Back then I was a foolish twenty-something dieting fanatic and would COMPLAIN when he spent hours in the kitchen cooking dinner for me. On some days I’d choose dexatrim and diet coke over his slow-cooked curries. And when I think about all the times I passed on his crispy deep-fried spicy potatoes or his home-made sausage, I want to go back in time and slap myself silly. Perry not only mastered Indian recipes, but he also whipped up platters of Indonesian, Japanese, Chinese, Greek and South African delights. His kitchen was an absolute foodie paradise. When he called last month about getting together for lunch (with his co-pilot in tow), I suggested we meet at my favorite Indian restaurant, Gangadin. I’ve been going there for years, but hadn’t tried the traditional Tiffin Service lunch specials yet (photos below). 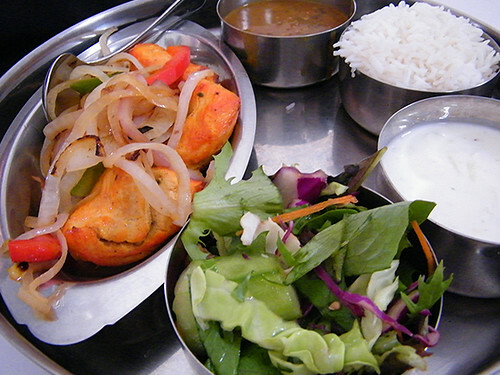 These lunches start at just $8.95 and come with five items served on a traditional tiffin tray. Besides your main course, you also get a side of daal (split lentils cooked with spices and creamy sauce), salad, raita (yogurt and cucumber) and basmati rice, all served on cute, metal dishes and trays! It’s always fun reminiscing with old friends and family, and it’s even better sitting around a table of spicy goodness (at least for me). I don’t think I’ll ever redeem myself for those non-eating-dieting years way back when, but you can bet that nowadays I finish every last bite. Chicken Tikka Boneless juicy chicken marinated in homemade yogurt, spices and grilled in an authentic Tandoor oven. Chicken Korma Tender pieces of marinated chicken with spices, onions, yogurt, and assorted nuts. 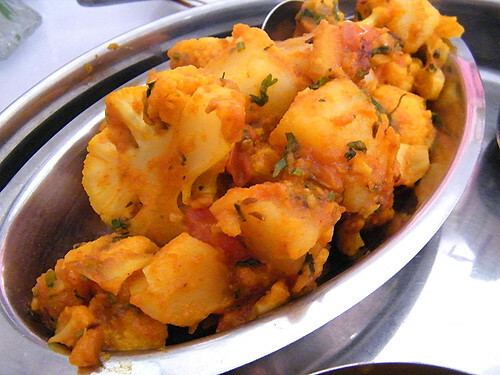 Aloo Gobhi Cauliflower and potatoes sautéed with tomatoes, ginger and special ground spices. This is SO SPICY and comforting at the same time. More about Perry on “About” page. Perry sounds a stand up guy. But you managed to continue to marry well. 🙂 Peter is awesome. It’s great that you guys all continue to speak, and go to lunches/dinners. There is nothing more comforting to me than spicy Indian curries, with Naan and lots of fragrant Basmati rice. Enjoying a meal like that, with people you enjoy the company of — those are the ingredients for a very good day. I love Indian food. Why haven’t I heard of this place? I’m taking note. The food looks delicious. I’m really liking the samosas. I’m not sure if it’s just the angle you took the picture, but they look so big! Definitely the angle on the samosas. They’re pretty good size but look gigantic! “Positively Delicious” really fits your site! With every single post. Thanks Afaf. I was just thinking how fun it would be to see you and Perry in the kitchen at the same time! Battle of the best home chefs!!! I love it that you can have lunch with your ex husband and give him credit for the good foods that he made you, focusing on the positive side. That’s what is great about you, not many people like that. Thanks so much Sarah. Much appreciated. I’ll have to make the trek for that. The one restaurant I REALLY want to go to near LAX is the Buggy Whip! Steaks and old skool Piano Bar! It’s pretty cool that you are friends with your ex and after so many years too. This restaurant sounds excellent! 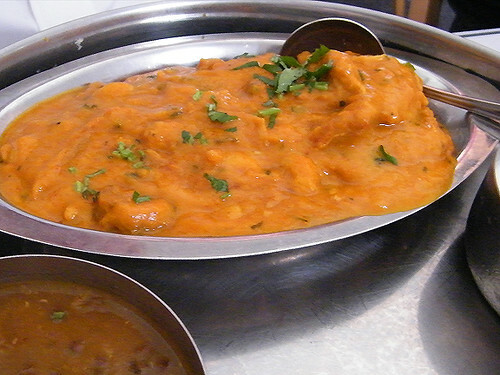 We’ve been looking for a good Indian restaurant in our area since we were disappointed with our last one we ate at. We temporarily satisfied our cravings for Indian food in London, but now it’s really time for us to find a good one locally. Oh, I definitely think London Indian RULES above all. My most recent fave was at “Indian Connoisseurs” in Paddington. Where’s your favorite? OMG! I am so behind in reading posts! But now I know WHY we are friends!!! We have the same (great!) taste in restaurants. I LOVE Gangadin. Have tried several other Indian restaurants (Westside mostly) but have found the G to be the stand out. We have to go sometime. Loved the cooking ex-story too. Please post the ‘Ex-Afaf Cook Off’ on You Tube so we can all enjoy! Or at least submit it to the Food Network (?)! You’re lucky to have such a good relationship with your ex. Truly special. Great choice for lunch. I can just imagine the wonderful warm spicy scents. Yum! I am drooling on my laptop right now. What a pleasure to know such great cooks and also to be such great friends with your ex. You must not have been too foolish in your youth, at least you let Dexatrim go, I hope! I’ve wondered about this place for a while. The food looks great. Will definitely have to try the Tiffin Service with an order of samosas. 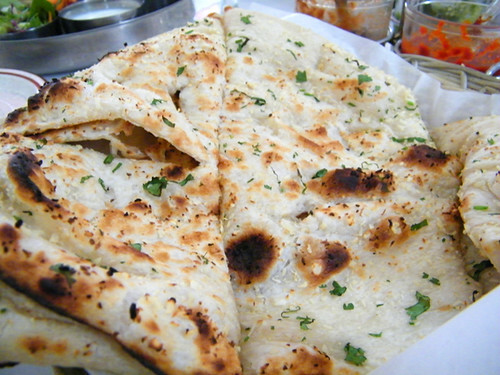 you just made me hungry and now i am in desperate need of indian food! 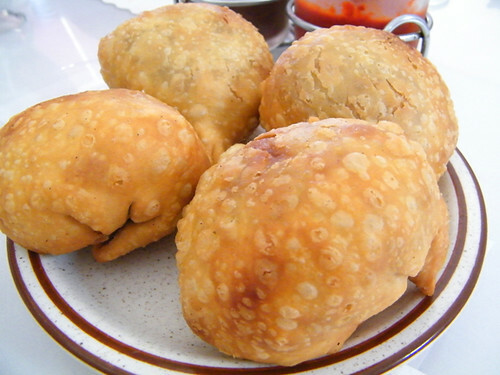 I have seen few Samosa dish were they fill it with panner and every time I attempt that the Samosas, the covering breaks up. Let me check how it works using your recipe. This is the best indian restaurant in LA, its been there over 25 years. The food looks delicious. Will definitely visit when I’m in LA next.